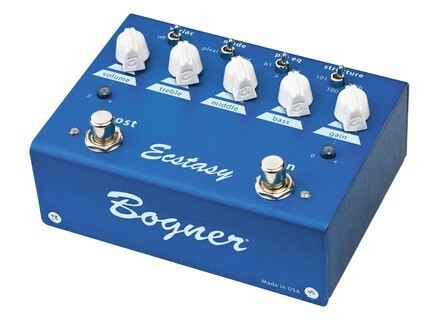 Ecstasy Blue, Overdrive pedal from Bogner. Megajp's review (This content has been automatically translated from French)" The Swiss Army knife." This is an Overdrive, decorated d 'a Boost with 3 bands and several équalo switch setting sensible reproduce the typical sound of the famous amp of the same brand. Everything is available analog "by hand", that is very convenient to repeat, beef or live ... you can quickly adjust the sound to the ear. Although fairly imposing it integrates perfectly into a pedalboard with input jacks and 9V power supply, manufacturing is neat and very strong. the large number of toggle switch allows you to set the type of saturation with desired precision. For my part, after a year of use I am Variac: OFF the side tube amp missing fishing don 't embale, those seeking the "root" Blues or maybe ... well I don' have not yet deepened thing. the mode is Blue, I have bought a pedal Bogner it's not for sound Marschall Zounds! Pre eq structure and then ... I put mystery mostly B1 and 101 which must match the preamp of a well known ... at BOGNER! Amp! Volume and 60% gain which varies between 40 and 60% depending on my mood. For Equalisaton I'm rather a fan of 6-3-3 expensive to Didier Deschamps ... with 6 acute. For BOOST I put the gain and volume to 90%, that is supposed to be my sound for solos, to exit the MIX. Ouch, ca spoils a bit. I thought I had a big sound in a rhythmic and are well defined and powerful solo. no! pedal walking backwards I have a very nice overdrive rhythm (Tube Screamer style) and a big sound (Big Muff style) in Boost. Maxon OD-9, Electro Harmonix Big Muff, Pro Co RAT are my "unassailables"
and then those who have gone to oblivion Boss, Ibanez, Marshall not to mention, although the Boss super stack left me good memories. 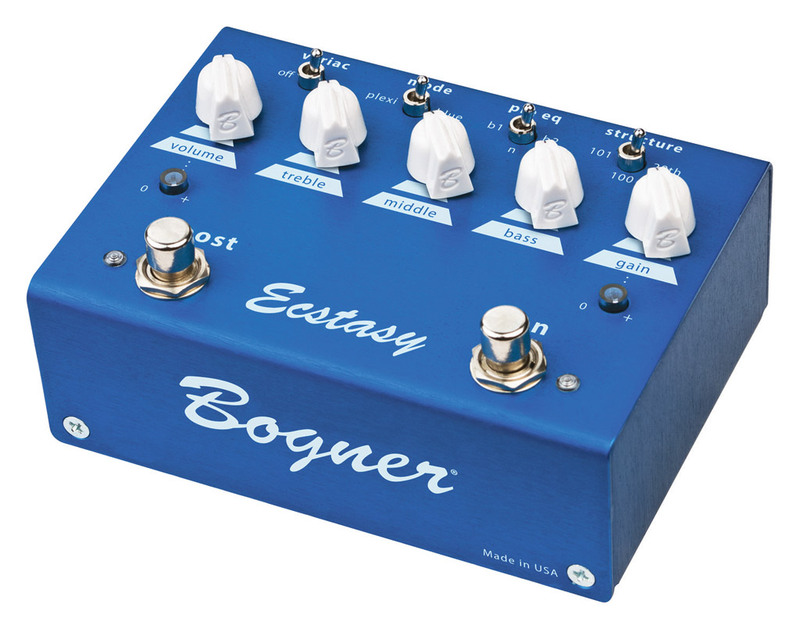 I like the Blue Ecstasy, I find it pretty convenient [especially can jump clear sound (bypass) to Boost], tru bypass and no buzz make a queen pedalboard. I'm pretty disappointed with the sound rendering, okay I have a Mesa Boogie Road King with saturation and the boost will not equaled pedal. So I bought this pedal to compensate for the absence of my amp, so it does not matter. However the TubeScreamer side + Big Muff 300 € in fact a good quality / price ratio (the breath of the Big Muff less). Another negative wha-wha (mine is a Custom Audio) and Boost, it works not strong, ca hand spin in the treble. Be put behind wha saturates say to me, but I is Wha Tuner + + + + Delay Sature Vibe worse and that is all! In conclusion it's a great pedal, but we must see it in the meeting of OD and a FUZZ sound reproduction rather than the tube amps of the brand. If the pedal is expensive even then too expensive to streamline things a little, we say that it is handmade it is signed Bogner etc ... except that it is in motion larfeuille € 295 less it is " holiday I forget everything "
greg11100's review (This content has been automatically translated from French)" Before I Blue .... but that was before." Beautiful object, not heavy enough to make junk, flawless finish, high-class components for analog pure cold pressed juice. Mono input / output, an entry for a remote control via MIDI, 2 footswitches for true bypass effect on / off & boost on / off. A row of knobs usual mini knobs to adjust the pre gain and assignable volume boost. A series of mini switch to sculpt his grain, gain, EQ and even the voltage ... in short, everything is permitted. Variac adjusts the voltage, you can put the pedal on and so release a bit more dynamic. Plexi / Blue: it selects the mode as clean boost or more saturated. 100/101/20th: grain structure corresponding to different preamps brand. Mini generic manual is supplied with the pedal, but there is a plethora of demos - video clearly clarify the possibility and purpose of each command. The adjustment possibilities are almost endless and really distinct from one another. First impression: the reserve db is quite impressive given the short, see the lack of wind generated! Secondo is truly dynamic ... but then something hearty! We immediately want to play the fingers is to bosser his volume knob on the guitar. The definition is really great over the entire range of frequencies. Plugged into a Blues Deluxe, this type of pedal is a real upgrade for an amp of this range then a third channel to be left permanently connected as it is addictive. Plexi, plugged into an amp on the edge of crunch, a bit of reverb and it's immediate orbit. Blue is a more granular fashion hair but remains in the large registry overdrive. The boost to its name. Most of the time, boosting a signal already saturated, it Degomme part of mediums to gain profit. Not on Ecstasy instead. Plugged into one of the great years old Blackface Fender reverb wish, it must be falling. Steeped recently on my pedalboard, I think she is not ready to leave. I had the same feeling when after a series of pedals wha I ended up giving me an RMC Picture Wha, we finally said before that we had not actually used wha worthy of the name. Well there is the same. We have the right to think that at this price, we refuse to believe anything negative about the acquisition ... The thing is that so-called "boutique" enough to prohibitive tariffs effects, I being locked some over time, I have rarely been disappointed to be honest, but I often ended up getting bored for the final resale (and leave the tunes on the way!). Bogner on the problem upside down to that I say the day I give myself an old Vibroverb 64, I have at least enough to send a crunch at the height! € 300 for a pedal it is expensive for a Bogner .... it is another thing.